The Versaflex® System is a factory assembled flooring system and consists of a polymer carrier bonded to the back of the full body porcelain top surface. This carrier has a joining system that consists of a series of pegs which are moulded into the sides of the grid. 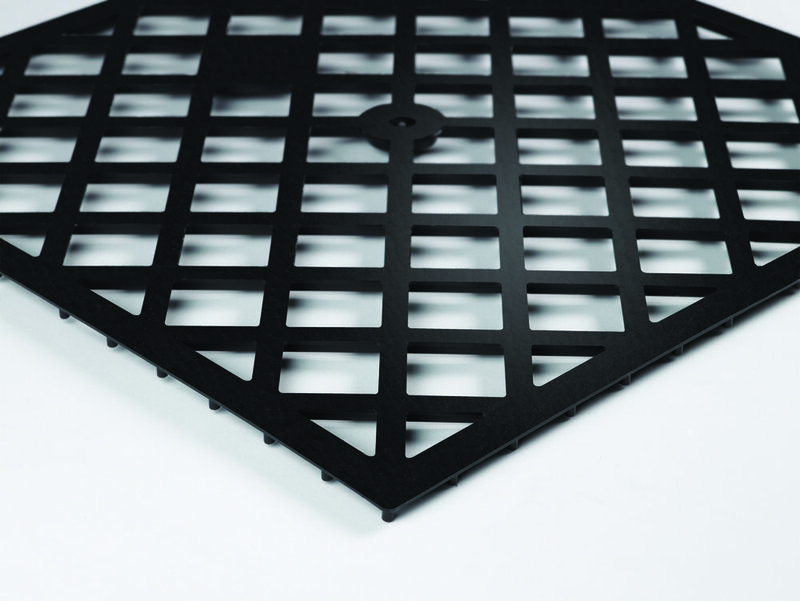 The carrier consists of two parts: a metal support sheet and a polymer grid. An L shaped flexible joining strip (or “grout”) is perforated with holes which the pegs interlock with. The grout carries the flexible grout line which fits between the porcelain top surfaces. These are supplied directly bonded to the grid. The coupling/grout (joint) element is a detachable flexible L-shaped strip encasing each tile on two sides attached to the carrier. Attachment is achieved by incorporated locating pegs which work with perforations in the coupling/grout element to pull the system together. Assembly of Versaflex® tiles is done with a vertical movement placing the pegs of the carrier onto the holes of the adjacent tile coupling/grout element. Pressing the carrier pegs into the conically shaped holes forces the tiles against the flexible joint element creating a water resistant seal perfectly suitable for commercial (machine) cleaning. Total module height: 20 mm / 0.79"
Versaflex® complies with and outperforms specifications of the ISO-EN 10545 norm. When installed on top of raised access flooring, Versaflex® complies with the relevant North American CISCA norms. Since Versaflex® is developed for use in commercial projects, the standards for the dry lay system are set to at least comply with the most challenging test for conventional wet lay tiles, specifically regarding the main challenges for tiles: impact strength, breaking strength, durability & resistance of the top surface and contact sound reduction. Versaflex can be installed wall to wall in various lay-outs. Versaflex can be installed using the following installation techniques.